variety of restaurants all in spectacular settings! 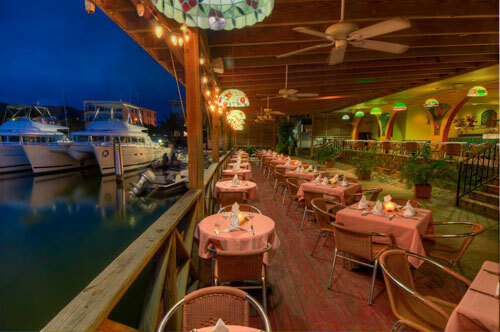 On the property you will enjoy a delectable meal amidst comfortable breezes, cool music and magnificent yachts. The open-air restaurant serves breakfast, lunch and dinner daily, from an American influenced menu with buffet lunches some days and sushi on Fridays, as well as a tempting Sunday brunch. Come shake a leg and dance the night away on Wednesday and Saturday nights with live music. During Happy Hour you will find our dockside bar and grill packed with local residents as well as hotel and marina guests who come to relax in the warm trade winds and to cool off with a thirst quenching drink. We offer a host of enticing tropical cocktails and Caribbean beers – making us one of the British Virgin Island’s best stocked bars! For the ultimate dining experience, the dockside grill serves a varied menu and the freshest ingredients – all prepared by an inspired chef to treat the eyes and seduce the palate. Each night lobster from the local waters and huge New York steaks are flame-grilled to order along with fresh conch, tuna, snapper and wahoo caught by local fishermen. From savory mango, avocado and coconut to delicious curry, roti and sushi – the diversity of enticing ingredients is absolutely amazing. Live Music Every Wednesday and Saturday Night! 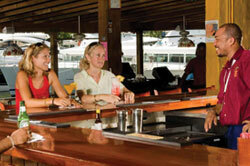 Village Cay Dockside Bar Good Food, Good Drinks, Good People!